June Johse, 87, of Clute, passed away Monday, February 4, 2019. She was born October 1, 1931 in Freeport, TX, to Gordon Slaughter and Lena Moore Slaughter. She was preceded in death by her parents and husband Henry D. Johse. She is survived by her children; son, David Johse and wife Malae of Angleton, TX, daughter; Kim Bennett of Lake Jackson, TX. Grandchildren; Danielle Venglar (husband Shannon), Ronny Johse, Daniel Johse, Austin Bennett, Chase Bennett, Amanda Lincoln and Tara Hewitt. Great grandchildren; David Venglar, Morgan Venglar and Beniah Hewitt. Brother; Bob Slaughter and wife Mary Ann along with many nieces and nephews. She was a lifelong resident of Brazoria County. She retired from Dow Chemical after 31 years of service. A founding member of First Baptist Church of Churchill, TX. 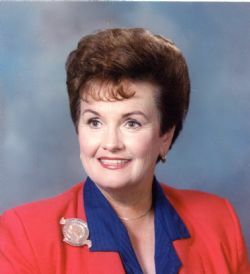 A lifetime member of the Brazoria County Fair Association where she served as their first woman President in 1989. She was a committee member for the Houston Livestock Show and Rodeo. An avid hunter and fisherwoman who enjoyed being outdoors. Other talents/hobbies included oil painting, bird watching and reading. The family will receive friends at 11:00 am Saturday, February 9th at Family Life Church in Lake Jackson with funeral services starting at 1:00 pm with Pastor Craig Taylor officiating. Burial to follow service at Brazoria Cemetery.